While not alone, IDC has prominently constructed media narratives explaining why Apple's iPad can't possibly matter over the last eight years, initially because it didn't run the all-important Microsoft Windows, then because masses of ultra-cheap Android tablets were portrayed as an insurmountable "market share" diluting force, then because Microsoft itself was entering the tablet market with Detachables, and then because public interest in tablets appeared to be seriously dissipating in favor of more conventional computing devices. However, IDC has recently been forced to essentially admit that it was completely wrong about virtually everything in the tablet market. Tablets were indeed having an impact on the demand for conventional PCs. The public clearly wasn't buying into Microsoft's vision of tablets, whether the original Tablet PCs, Windows RT netbooks, or the latest batch of Surface-like Detachables. People who needed Windows were sticking to conventional notebooks. 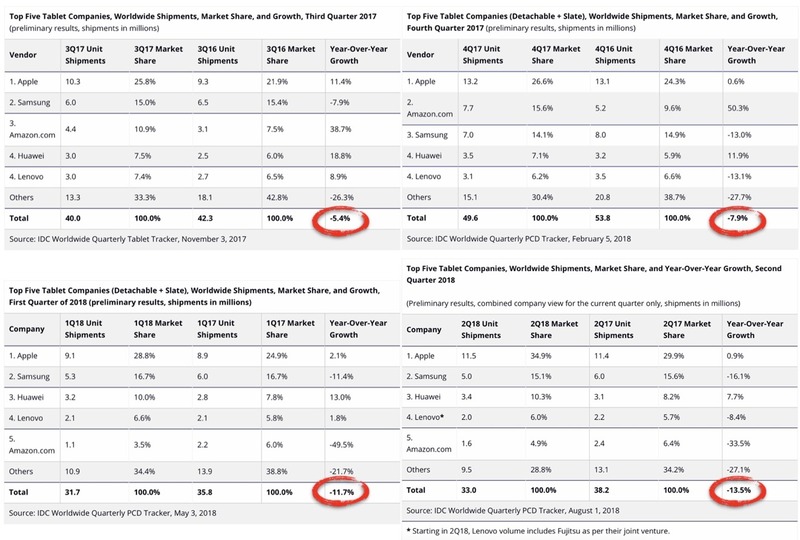 And the hardest fact to deny: Apple has remained the market leader in tablets in the critically important metric of dollars earned—as everyone else with a tablet strategy crumbles or stagnates in a global market that's shrinking faster every quarter. Global tablet sales have shrunk YoY (year-on-year) for the last fifteen quarters, according to IDC's data. Across just the last year (shown in IDC's quarterly data below), the pace of declining global tablet unit sales has incrementally accelerated from a 5.4 percent drop last fall to 13.4 percent drop this summer. As the global tablet industry collapses, Apple's ~10 million iPads shipped quarterly have ballooned from a quarter to a over a third of all the tablet shipments IDC estimates. Only two of the top five tablet makers have turned in quarterly growth in each of the last four quarters: Apple (the largest tablet maker, which sold over 44 million iPads) and Huawei (which shipped 13.1 million tablets). 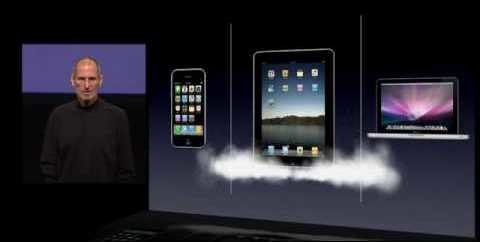 Across those four quarters, Apple's iPad sales grew incrementally, adding just under two million new sales. Second place tablet vendor Samsung lost more than two million units over the same year, and its total annual sales were only 23.3 million to begin with. Note that Samsung sells over 70 percent more phones than Apple but earns only half as much. In tablets, Samsung is moving about half as many units as Apple across an impossibly wide range of different models (and platforms) that can't possibly be making any money at all, even as the general demand for tablets bleeds away. The world's third place tablet vendor by units is Amazon, with annual sales of 14.8 million units over the last four quarters. Amazon's sales are extremely seasonal however, with nearly all of its sales occurring during the Q4 holidays and on its Q3 Prime Day Sale, when it blew out units of a 7 inch model for under $30, as IDC noted. The best IDC could say about Amazon's tablet business is that the company is now incorporating Alexa in the hopes of bolstering Amazon's retail sales. But we also know that Alexa is used mostly for playing music, that only a tiny 2 percent of its users have ever placed an order with it, and that 90 percent of those who have subsequently never tried to place an order again. The fifth largest tablet vendor is Lenovo (combined with a joint venture with Fujitsu), which collectively shipped 10.2 million units over the past four quarters. IDC also counts another 48.8 million tablets from "other" vendors. However, this group of other tablet vendors reportedly shipped 65.9 million in the previous year, accounting for a 25.9 percent collective drop in units YoY. The fact that Apple's iPad sales are growing within a market that is shrinking significantly—and has been for the last four years—is particularly remarkable when you note that Apple's least expensive iPad is $329, or about ten times higher than the loss leader that accounted for much of Amazon's sales volumes (and a vast number of those "other" tablets). Just as with smartphones, watches, and PCs, Apple is proving it can grow and profit within the shrinking, cutthroat tablet market. All of the iPad boogeymen that IDC previously invented—"powerful" Windows tablets, cheap Androids, and then tablet indifference (the idea that customers really want a PC or a smartphone, but certainly not an iPad)—have not unseated Apple as the top vendor of tablets raking in tens of billions in revenue. The last hope for some real iPad rival has been Microsoft's push to get PC makers to build a tablet-like device that runs Windows, which IDC named "Detachables," as distinct from notebooks or notebooks with a convertible display offering some tablet-like functions on a full sized PC notebook. In 2015, IDC explicitly predicted that Windows Detachables would rapidly eat into iPads on the high-end, offering users a hybrid middle product that was more powerful than an iPad, but more tablet-like than a MacBook. Three years earlier, IDC had similarly predicted (again without any evidence) that Windows Phone would arrest demand for iPhones by 2016. Both were a simple endorsement of Microsoft's strategy, without any data backing up the idea that the company was really stoking any demand among buyers. A major focus of Windows 8 and Windows 10 had been the addition of touchscreen features and a Windows Phone "Metro" interface to forge a new PC category that was sort of iPad-MacBook, to take on both the iPad and MacBook, after failing to successfully take on either iPad or MacBook alone. The Microsoft-IDC strategy of Detachables (aka the "2in1") worked out about as well as when Samsung applied the same logic in competing with Apple's iPhone and iPad by releasing its 2011 Galaxy Note, a middle-sized mobile device that was a large phone and a small tablet in one box. Critics hailed the new "phablet" and called it a success immediately after it shipped its first two million units. Yet like Microsoft's Detachables, interest was initially limited. And then once it appeared to be picking up steam, it ran into competition from Apple itself. Apple launched its larger iPhone 6 models in 2014, crushing Samsung's high-end, larger phone business and forcing it into a much less profitable cheap territory of middle and lower-tier smartphones, where it has been stuck ever since. A year after launching its own larger iPhones, Apple debuted the new iPad Pro. In its first full quarter of sales it dominated the Detachable PC market Microsoft had been trying to build up over the previous three years. If Apple had only been able to quash one huge multinational rival and strip bare its competitive strategy, that would have been impressive. But to deftly strike down both, just one year apart, forcing both the world's largest handset maker and the largest platform licensing company to scramble up expensive new survival strategies while writing off losses as Apple stood on their faces and raked in all the profits is really quite remarkable. Last November, after years of hyping Detachables as the way Windows would take back the tablet market from iPads, IDC analysts noted that "growth in the detachable tablet market has been slower than expected," adding that "Apple and Microsoft are essentially the only two vendors supplying the category" while "other PC vendors champion the convertible PC form factor." 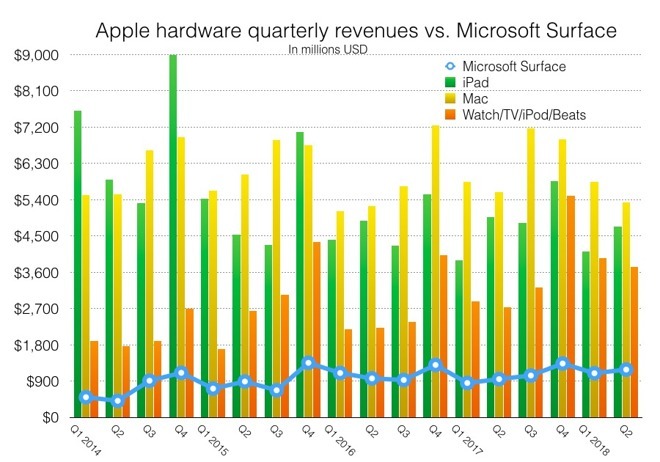 IDC writes of Surface and iPad as if they are neck and neck, but iPad generated $19.5 billion over the last year while Surface struggled to bring in $4.7 billion. Macs added another $25.2 billion in revenues over the same period. In other words, despite Microsoft's efforts to push Windows PC makers to build devices like its own Surface, those licensees preferred to build more conventional laptops with some tablet or touch features layered on top. That left Surface to be "essentially" the PC Detachable market. The following quarter, IDC reported that the premium Detachable segment of tablets had reached 6.5 million units, chalking up 10.3 percent growth over the previous holiday season. Given that Microsoft reported only $1.3 billion in revenues for all of its Surface devices, that means that Apple, "essentially" the only other vendor, sold most of those in the form of iPad Pro. The revenues Microsoft collected could only represent at best about 1.3 million Surface units (at an Average Selling Price of around $1,000). Further, the ten percent growth in Detachables that IDC reported certainly didn't come from Surface sales, because Microsoft's revenues over the holidays were virtually flat YoY. On the other hand, Apple's holiday iPad revenues grew by ten times as much as Surface YoY while its holiday quarter iPad unit sales were flat. That means Apple's ASP increased, indicating that it sold a more premium mix of iPads, including the newly-refreshed mid-2017 iPad Pro models. If Microsoft's Surface can't compete with iPad Pro, it makes it easy to see why other PC vendors are avoiding the same direct competition with Apple and instead marketing more conventional notebooks, a business they see as more secure and reliable. Are tablets even relevant anymore? Steve Jobs introduced iPad as a new device category between the iPhone and a notebook, noting that the only way it could stand on its own is if it could be much better at some tasks than either alternative. Apple wasn't trying to replace the Mac with iPads. Instead, it has increasingly presented iPad as a replacement for basic PCs, with Macs serving the demand for more powerful computing tools above it. While IDC inadvertently documented the floundering waves of would-be iPad competitors for years, in retrospect it's now clear that iPad serves a role that cheap Android tablets can't. In fact, after glutting the market with loss leaders, cheap Android tablets have fallen drastically and keep shrinking. On the other end, Windows PCs acting as tablets have also failed to blunt the rise of iPad. Windows 10 was supposed to displace iPad demand with devices that could run "real" Windows software, but we simply haven't seen this happening. PCs are shrinking alongside tablets globally. In fact, the only thing that has really decreased the sales of iPad have been Apple's own larger iPhone models, which clearly did erode the demand for smaller iPad minis after those smaller tablets peaked in popularity in 2014. This actually worked out pretty well for Apple, because larger iPhones command a much higher price than small iPads, are more profitable, and have a shorter replacement cycle. 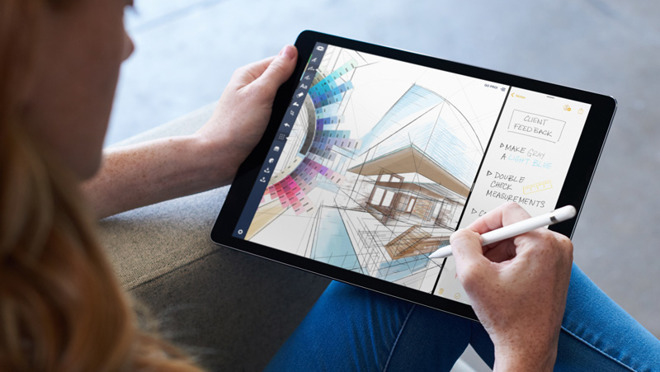 At the same time, Apple has more recently pushed iPad into a stronger role with the new iPad Pro and iOS enhancements that made it a more powerful multitasker. These models are now bumping up into what was once the low-end of Apple's MacBook range. And in turn, Apple's Mac notebooks have incremented up into higher-end tiers with pro features including Thunderbolt's ability to connect multiple 4K displays and high speed storage—something even Microsoft's most powerful Surface Studio 2 stationary PC can't do. If there is any remaining doubt about the value of tablets after the collapse of cheap Androids, the fizzle of Windows RT, and the stagnant Surface, consider a detail of a recent study that was almost entirely overlooked. 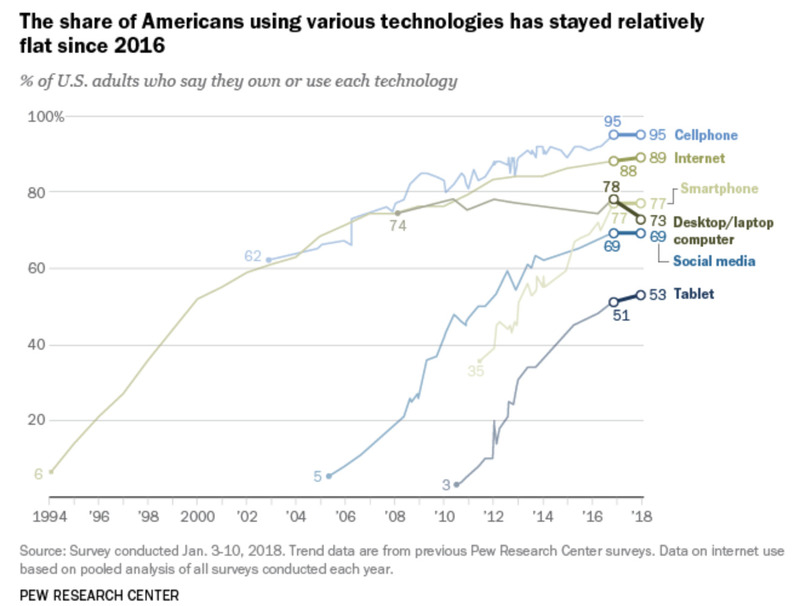 Last week, a Pew Research study on internet and social media use found that after "long stretch of rapid growth in the United States," the number of people "who go online, use social media or own key devices" has plateaued over the last two years. This was widely reported. But there was one notable exception: a growth in tablet use. This wasn't widely reported. While smartphones remained flat with a reported use by 77 percent of U.S. adults over the last two years, and desktop/laptop computers actually decreased from 78 to 73 percent of users, tablet use among American adults increased from 51 to 53 percent. That's a slower rate growth among tablet users since the survey began tracking tablets in 2010 (when just 3 percent reported using one), but it indicates that use in the U.S. continues to grow even as the global market for tablet sales decreases. Note that Apple's Mac sales are incrementing upward despite a significant drop in reported PC use over the last two years. Yet in tablets, use is increasing even as the market overall is shrinking. That strongly indicates that Apple is fueling that growth, in part by finding new uses for its tablets. For consumers and education, Apple produces its own apps (including Garage Band, iMovie, Keynote, and Swift Playgrounds) and works to help developers build tablet-optimized titles that don't exist for Android and Windows. In the enterprise, Apple has similarly worked to forge relationships with IBM, Salesforce, Cisco, Deloitte, SAP and others to build solutions around iOS. It has also pursued initiatives such as Apple Business Chat. The fact that Apple is uniquely fostering adoption for iPads as a premium device and in the enterprise—rather than simply throwing out tablet hardware to see if anyone will buy it—is reflected in other data Pew compiled. While 53 percent of American adults use tablets, 58 percent of adults under 49 do. That indicates that tablets are even more popular among working age adults. Among users with a college education, tablet adoption had reached 66 percent. In households with an income of $75,000 or above, tablet adoption had reached 72 percent. These demographics of working age, educated and more affluent users also reported higher adoption of smartphones and laptops (surpassing 90 percent of users). Pew referred to these numbers as "near saturation levels" for these technologies. It's become clear that in many markets, everyone who wants a smartphone or laptop already has one, meaning that Apple is now largely selling replacements and Services to an installed base. However, the high (but relatively lower) use of tablets—and their growth in use over the last two years—indicates that Apple still has a significant potential for selling iPads to new users even in the U.S. And in other countries, that demand is even higher. While Apple continues to step up its game in tablets, Microsoft has shifted its initial Surface portfolio from its initial, more tablet-like range to a series of devices that look and work more like a conventional notebook. It advertises Surface against MacBooks rather than iPads. Clearly, Microsoft doesn't see much potential in a pure tablet product. Google went even further, dumping its Pixel tablet strategy entirely—after PC vendors including Dell and HP first threw in the towel on their Android tablets. IDC still carefully avoids revealing its estimates for Apple's iPad Pro, or making any direct comparison to Microsoft's Surface sales, but at least the IDC's pantheon of iPad boogeymen have been put to rest for a more realistic appraisal of the tablet market—at least for now. It only took eight years.